An innovative, ingenious window into the positive possibilities of childlike imagination from the eyes of individuals, pairs and parents, Cahoots NI's Penguins, produced in association with Birmingham Repertory Theatre and Prime Theatre and staged at The MAC as part of the Belfast Children's Festival, is a beautifully boundless, ceaselessly charming concoction for children and adults alike. Based on the true story of Roy and Silo, two male chinstrap penguins who hatched an abandoned egg and raised a chick at New York's Central Zoo, Paul Bosco McEneaney's work, choreographed by Carlos Pons Guerra, takes a cue from Cahoots' brilliant Shh! 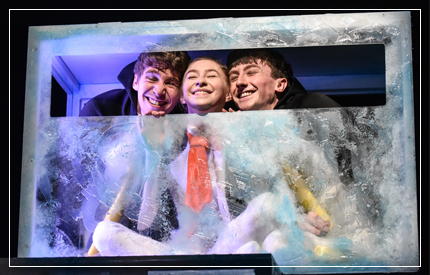 We Have A Plan in that no words are spoken and that everything on the colourfully lit set - masterfully designed by Sabine Dargent - arises from mime, mimicry and more catchy Garth McConaghie music. Penguins scores high, if not close to maximum, marks in all three categories. Penguins begins by introducing us to a wide-eyed, happy zookeeper, played with perky charm by Corey Annand. In holding an egg, and a steak, she presents something to hatch and something to feed – what will be life as art, and what was death as food – before wrapping a rug around her neck, to "roar" like a lion. So far, no penguins, but the joys and realities of her job have laid the foundations for the play pen in which the title characters will spring to life. And in that pen, director McEneaney, choreographer Guerra, composer McConaghie and dancers Osian Meilir and Jack Webb will do a series of very interesting things to keep us on the edge of our seats for nearly three quarters of an hour. The emergence of the chick, played by Annand again, adds balletic grace to an already entrancing series of movements, taking an already impressively physical and sporadically magical show to the level of exquisitely emotive. And it is to Penguins' credit that the production team avoids the easy trap of making its penguins too cool for school. What we see isn't a funny "march of the penguins" or even a silly penguin dance. It's just penguins in a zoo being penguins in a zoo, inhibited by structure but inhabited by childlike wonder and fascinated, even enthralled, by the possibilities of parenthood. Instead of a demand for freedom, they relish their comfort zone, and what they – and we – get is an relentless oasis of positivity. It may be an understandable concern among older viewers that Penguins romanticises captivity, but I would beg to differ. What the production really seems to be saying is that what a human or animal creates, in this world, isn't solely defined by who they are, but also by where they are. Freedom alone isn't enough to make a mark or find a voice. What Roy, Silo, the zookeeper and the chick create for us to enjoy is part of the restrictions enforced on them by where they live, work and play. Every "restriction" is certainly an obstacle, but it is also a challenge which they relish and where new life emerges within and without. In short: wherever they are, whenever they are and whoever they are surrounded by, the penguins in Penguins are vibrant, energetic, and above all, happy. Because, in their bonding and development, they are discovering new things. And discovery is one of the main sources of happiness. before it went on tour to the Roe Valley Arts & Cultural Centre in Limavady and Armagh's Market Place Theatre.